Tanglin Village, already a hip dining enclave, is getting another lifestyle quarter - one that boasts well-known multi-label fashion store Dover Street Market. To make way for it, two tenants - eatery Chang Korean BBQ Restaurant and antique store Shang Antique - will move out when their leases expire on Feb 29. In their place will come "Como Dempsey", a complex housing Dover Street Market, an edgy concept store conceived by Comme des Garcons' Rei Kawakubo, and a specially conceptualised restaurant and bar by renowned French restaurateur Jean-Georges Vongerichten. The 5,268 sq m site, comprising blocks 17 and 18, will also have a new dining concept offering signature dishes from around the world. Popular local Peranakan restaurant Candlenut has been included in the proposal, although it could not share more details. Internships will also be offered to nurture emerging local talents. The Singapore Land Authority (SLA) and the Singapore Tourism Board (STB) yesterday announced that the joint tender for both blocks had been awarded to Como Lifestyle, a subsidiary of local fashion doyenne Christina Ong's Club 21, whose ventures include the eponymous retailer as well as luxury hotel brand Como Hotels and Resorts. Mrs Ong is the wife of property tycoon Ong Beng Seng. The tender was called, said SLA's director of land operations (private) division, Mr Lee Seng Lai, to "rejuvenate and bring new and exciting concepts to Dempsey". The new project is expected to "significantly contribute to creating and sustaining the vibrant Dempsey atmosphere and Singapore's tourism scene", said Ms Ranita Sundramoorthy, STB's director of attractions, dining and retail. Como Lifestyle offered to pay a monthly rent of $106,300 for an initial lease term of three years, renewable up till Dec 31, 2022. It won despite offering less than a third of the $350,000 per month its competitor, D Prime, did. 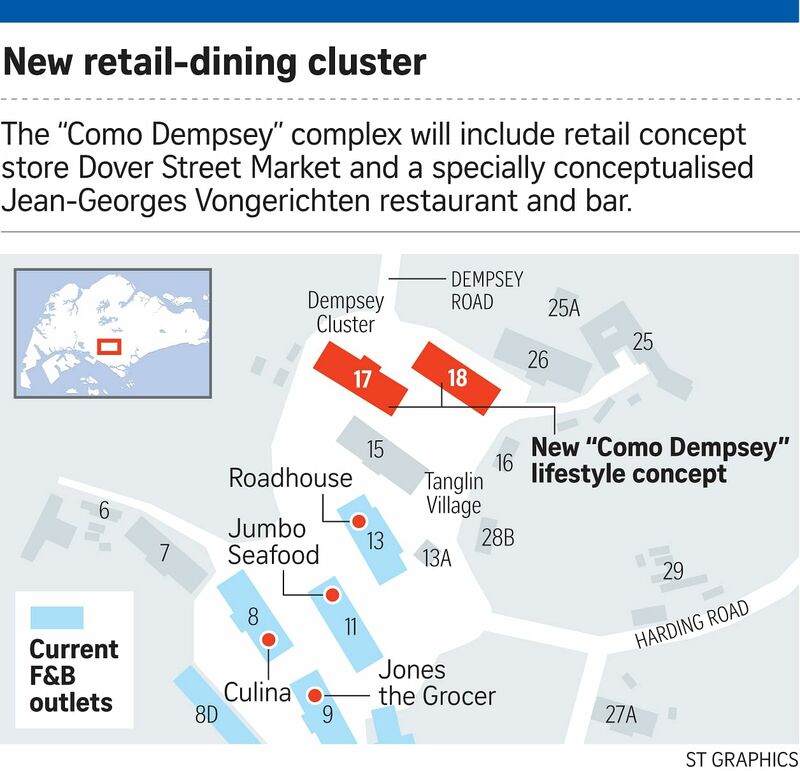 The debut of "Como Dempsey" will mark the latest chapter in the area's transformation. Tanglin Village started out in the 1860s as army barracks. In the 1990s, it became known for its furniture shops. After the turn of the century came upmarket restaurants such as PS. Cafe, as well as art galleries. In 2007, when Country City Investment (CCI) opened the Dempsey Hill dining cluster - now with more than 25 tenants, including Jones the Grocer and The Prime Society - the buzz grew. CCI's general manager Nicholas Ng said there were initial concerns about who would win the bid. "We are happy with the outcome. Como's concept complements our existing core of tenants. "There might be more competition, but in general, it will create more buzz and attract more visitors," he said, adding that the reliability of the winner was important. "If the concept fails, it will be really bad. Blocks 17 and 18 front the main entrance off Holland Road, and it is the first thing people see." The situation is less rosy for Chang Korean BBQ Restaurant owner, Mr Moon Hichan, who heard the news from The Straits Times. "It is bad. This is my main space with a customer base of more than 15,000," said the 51-year-old. "I was one of the first to open a restaurant in Dempsey. And now, they kick me out without offering me another space here. I am very disappointed." But Tanglin Village regulars such as Mrs Beth Demil, 58, are looking forward to the change. She said: "It will be nice to have more food options. I hope the retail development will offer something different from main street, like things you get in Orchard."